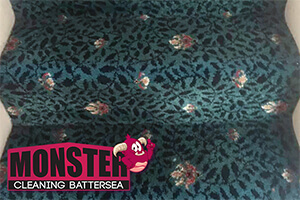 Monster Cleaning is a brand name that has become associated with high quality sanitation services in Greater London. As such we hold our standards high and never allow ourselves to make compromises with the customer satisfaction or comfort. Our trained, vetted and licensed expert technicians are here to provide you with solutions to all your problems, and deliver the best steam carpet and rug cleaning service in Battersea one can hope for. By utilising the power of steam we are not capable of removing dirt, soil, stains and even allergens from all rugs and carpets that our clients entrust us with treating. The thing is that no matter what the material the items are made of is, there is a proper way to clean them. And we know them all. We offer you swift, punctual and easy to apply solution that will not only make your rugs and carpets look like new, but also protect them from damage, overuse and the general passage of time. We strive for quality and we achieve it, without exceptions. Book steam carpet or rug cleaning in Battersea from us along with and end of tenancy cleaning treatment and receive a 50% discount for the first service. All newcomers receive £10 discount for carpet cleaning booked for more than £100. And if you book steam carpet cleaning for more than £100 along with upholstery sanitation, you will get 10% off the latter. Some of our regular steam carpet and rug cleaning prices, available to all our clients in Battersea, include: £22 for a small bedroom carpet or rug, £25 for dining or living room one, £26 for a large rug and £8 for a bathroom one. We are the best option for you when you want the best for your rugs and carpets. So there is truly no reason why you should not contact us, right? Do it now, and leave everything else in our experienced hands.